If you decide to travel in Japan using public transport you will be pleasantly surprised. It’s efficient, punctual, comfortable and clean. The train system, that includes Japan’s brilliant bullet train as well as its regular trains, is excellent. The subway is fast, frequent and user-friendly. Over short distances, taxis are reasonably priced and very clean. It’s worthwhile to have your destination written in Japanese to show the driver since many do not speak English. Remarkably, Japanese trains have an annual average late arrival time of only 38 seconds! They reach most places you are likely to tour in Japan and can be supplemented by buses or taxis. Reserve seats and use it as much as you can. Like most trains, platforms are marked to show where you are to wait to alight your reserved carriage. You will have 30 seconds to get on or off. Don’t worry, you can actually do it in time. We travelled on the newest Shinkansen line, inaugurated as recently as March 2016. 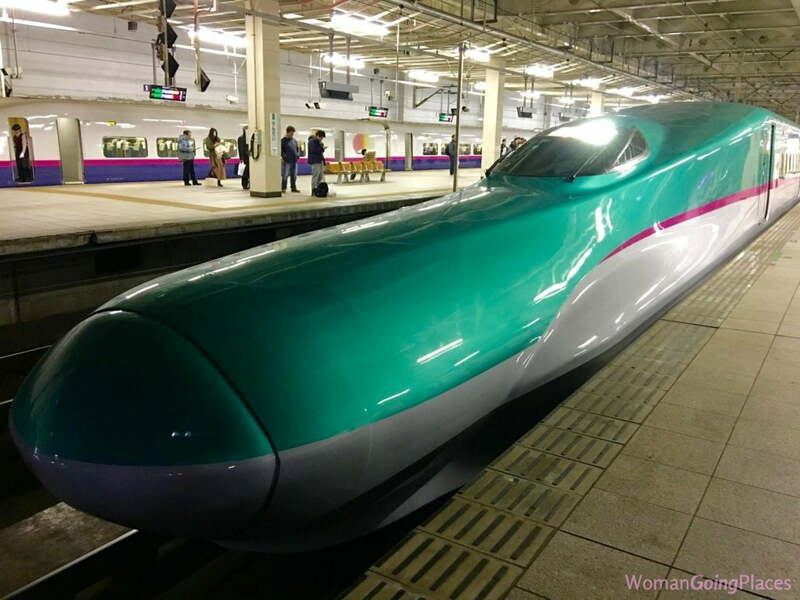 This sleek, green bullet train travels from the port city of Hakodate in the northern island of Hokkaido to Tokyo, with stops on the way that include the city of Sendai on the main island of Honshu. More than 50km of the journey is in a tunnel at a depth of 100 metres under the ocean between the islands of Hokkaido and Honshu. Our shiny new green train was connected at the rear to an equally shiny red bullet train, so it was actually 2 trains that together were hurtling above ground and under sea. It’s worthwhile and saves money to buy a Japan Rail Pass (JR Rail Pass) if you intend to use the trains. This pass allows you to go on most trains and Shinkansen (but not trains privately operated) and other transport such as the JR Miyajima Ferry. For more information about obtaining the pass and a user guide see JR Pass. Tokyo and Kyoto, the two cities in which you are most likely to use them, have excellent subway systems. On first descent into the stations, they may seem daunting with their myriad of lines and destinations and their banks of ticket machines, but help is at hand. Signs appear in English as well as in Japanese. There is often an information booth. A subway map in English is available at these booths. There are usually attendants on hand at all stations who will help you get your ticket at the machine and direct you to your train. They won’t necessarily speak English, but if you know your destination, they are remarkably helpful despite the language barrier. Again, if you plan to use the subways more than a very few times, it’s worthwhile getting an IC card for unlimited travel. See www.japan-guide.com for more information. Of all the options – trains, taxis, buses and shuttles – the fastest and most economical to and from the airport is the train. Narita Airport (see http://www.japan-guide.com/e/e2027.html for all transport options) is 60 kilometres from Tokyo and a taxi to central Tokyo is very, very expensive. You are much better off getting a train to central Tokyo and then if necessary, a taxi to your hotel. The same is true of Haneda Airport. Although nearer central Tokyo, a taxi ride there from Haneda can cost over AUD$100. For your transport options from and to Haneda see http://www.japan-guide.com/e/e2430.html. It would be remiss to talk about transport, especially trains in Japan, without mentioning that every train station or subway offers a choice of take-away food and drink. The larger stations have cafes, eat-in or take-away restaurants, bakeries and shops. Some even have department stores attached. They are in essence shopping arcades. Many of the restaurants are excellent and of good value. Even the most remote station will have a vending machine that offers hot and cold drinks. Or if you rushed to hop on the Shinkansen without having time to buy a little something for the road, fear not. A hostess will appear in your carriage with a food and drink trolley from which you can make a purchase. You are never very far from food when travelling in Japan.